We are neighbors. We live together as a culturally and economically diverse community. And, together, we are the near southeast side of Indianapolis: a community focused on the development of our neighborhoods. We believe that home truly is what you make it. And we’re determined to continue developing Indianapolis’ southeast side as a beautiful place to live. The Southeast Neighborhood Congress is a gathering of Southeast residents and stakeholders to monitor quality of life in Southeast neighborhoods. Attendees work together to identify the issues facing Southeast’s neighborhoods and implement action plans to address them, thereby updating the Southeast Quality of Life Plan. Additions and amendments cannot be made to the Southeast Quality of Life Plan without a minimum of 60 participants in attendance at the Congress. Review successful goals and action items from the Southeast Quality of Life Plan, and celebrate neighborhood-specific accomplishments. Review failed goals and action items from the Southeast Quality of Life Plan, and discuss potential for improvement. Between sessions of Congress, the Community-Building Team (CBT) monitors progress of the Southeast Quality of Life Plan goals and actions. Accomplishments, failures, issues, and concerns are identified. One week prior to the Congress, the CBT provides residents and interested parties with a summary and agenda for the upcoming session. 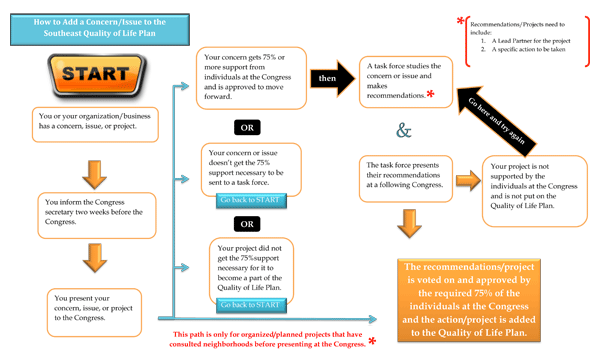 The Congress Flow Chart illustrates how to add a concern to the Quality of Life Plan. Click the image on the left to download a high-quality PDF. In the 1970s, I-65 carved its way through Indianapolis, leaving a series of devastating divides through the neighborhoods of Southeast Indianapolis in its wake. This area of the city would feel the effects of community deterioration for the next decade. In 1983, the neighborhoods of Southeast Indianapolis began to reunite. Organizations, such as Fountain Square and Fletcher Place Investment Corporation, lead home repair and urban design projects. Fountain Square Church & Community Project rallied volunteers to rebuild affordable homes. In 1991, both groups recognized the difference they could make as one revitalizing force. They came together as Southeast Neighborhood Development, Inc., commonly known as SEND. Today, a strong partnership among the residents of the near southeast side, SEND, and other neighborhood organizations has continued to increase property values, welcome new residents, and attract ambitious business owners. We came together as a community of individuals with one passion in common: we all loved our home in Southeast Indianapolis. We loved it enough to want the very best for it. The best for our neighborhoods, our residents, our businesses, and our guests. This passion became the fuel for all of our hard work. Countless hours of community meetings, interviews, surveys, and breakout sessions finally gave way to our Southeast Neighborhood Quality of Life Plan. And, in the summer of 2006, we would be given an extraordinary opportunity to put our plan into action. Great Indy Neighborhoods Initiatives (GINI) is a set of initiatives developed to help support Indianapolis neighborhoods by encouraging neighbors to work together and act on plans to drive meaningful change. In 2005, GINI announced the Demonstration Initiative, which would provide support for six Indianapolis neighborhoods. This support included seed funding for implementing a neighborhood Quality of Life Plan. We had our work cut out for us. Southeast submitted an application alongside 17 other neighborhoods from around the City of Indianapolis. Only six would be accepted. In the summer of 2006, after much deliberation, GINI selected Southeast as one of six neighborhoods to participate in the Demonstration Initiative. The time to implement our plan had come.